Making people smile is a superpower. When you make people smile, the whole world smiles with them. Smiling induces more pleasure in the brain more than chocolate. Don’t believe me? British researchers found that one smile (which is completely calorie-free) can generate the same level of brain stimulation as up to 2,000 bars of chocolate! So bring on the smiles! Here are 6 gift ideas (some sweet, some quirky) which are sure to lift up any vegan mama. Who doesn’t love avocado? Well, now you can keep one as a pet! Tin of Bean’s has crafted the perfect little avo keep safe! Even better, you can buy both avocado halves, one for you and one for your mum! Don’t like avos? No problem. There’s plenty of other little pets to opt for including beetroot and Brussel sprouts and pineapple. These quirky little pets are sure to make you smile with their characterful faces and cuteness. A little beauty. Simple and sweet, this dish has been handmade using traditional pottery techniques. Even the sun’s face has been hand-painted, making each piece utterly unique. Place rings, earrings, contact lenses, change and other important bits and pieces in this wonderfully characteristic bowl. A lovely gift that speaks wonders with its charming character and soft colours. You wouldn’t believe it’s under £5! Proclaim motherhood loud and proud with these hoodies. Busy Mums always have their hands full, so it’s important to have a faithful garment which will keep you snug and comfortable. Louies carefully crafts and personalises attire for both mums and their tiny treasures. Ranging from baby vests to t-shirts, why not buy matching tops for a mamma and their little one? Smiles all round! These beautiful glossy magnets are sure to attract attention in the kitchen. They’re big (3 inches) and bright and a fun way of celebrating a mum’s vegan lifestyle. 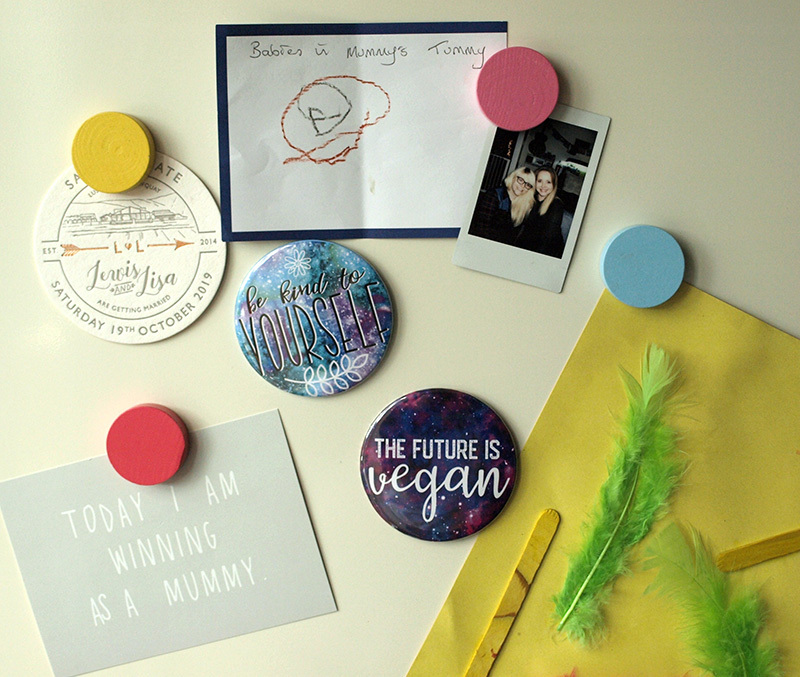 Visit their store to browse their fabulous range of greeting cards, colouring books and badges - they even sell temporary tattoos - all spreading passionate vegan messaging. Even better, 25p from each sale goes to Shetland Animal Rescue in Hale, Liverpool. No need to stress about gelatine here! Vegummies spoil sweet-lovers with over 40 different vegan varieties to choose from. Give mums all of their favourites. Order a gift bag and have fun filling it with whatever your heart desires. Classics include sour cherries, flying saucers and bons bons which you can mix up with jelly bears, liquorice octopus and rainbow belts! The tasty, colourful candy is then sealed in a pink and white stripy candy bag! Alternatively, you can have them all by ordering a 1KG mixed box! Perfecto!